Described in 20 sections, of between 4 and 16 miles (6.5-32km), it is an mainly flat route with good access by public transport and typically takes two weeks to walk. On its way it passes historic sites such as Greenwich, Kew Gardens, Hampton Court, Runnymede, Windsor Castle and Oxford. This guidebook features complete OS 1:50,000 scale mapping of the route and comprehensive information about accommodation, facilities, refreshments and transport links for each stage of the route. It is crammed with fascinating details about the places and features passed along the way. 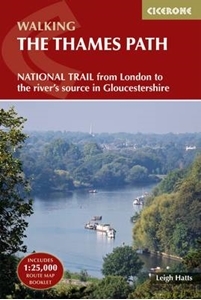 A separate pocket-sized map booklet is also included showing the full route on 1:25,000 scale OS maps, providing all the mapping needed to complete the trail. The Thames Path is an easy riverside walk that discovers the constantly changing character of the River Thames.